We all want to “stay woke”. Right? To be up on the issues of racial injustice and political correctness we need to keep current and stand up when it’s called for. For Dorian Belle, a Canadian pop star with a huge, fan-based, reality TV show, it’s more than that. He wants to stay woke while being black and get in on the black music scene. Unfortunately for Dorian, he’s white. Think Eminem and other white hip-hop celebs who have appropriated black culture in both music and style. It goes much further back than that with blackface, Elvis, the Rolling Stones and musicians who adopted (or outright stole) black music genres as their own. 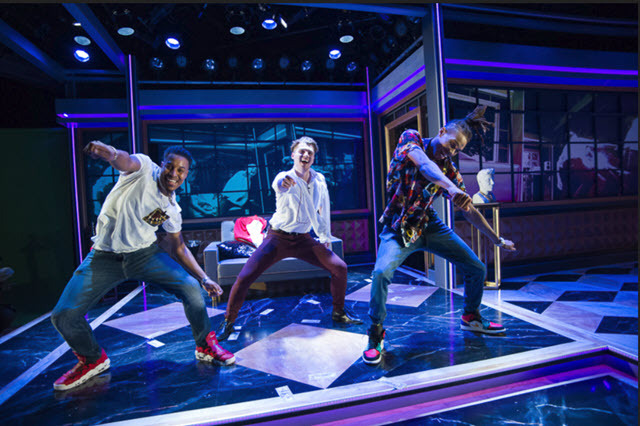 In truth, it’s complicated and that debate is the undercurrent of playwright Tearrance Arvelle Chisholm’s Pygmalion-inspired play. Dorian believes that taking on more of a black identity, would add to his street cred. 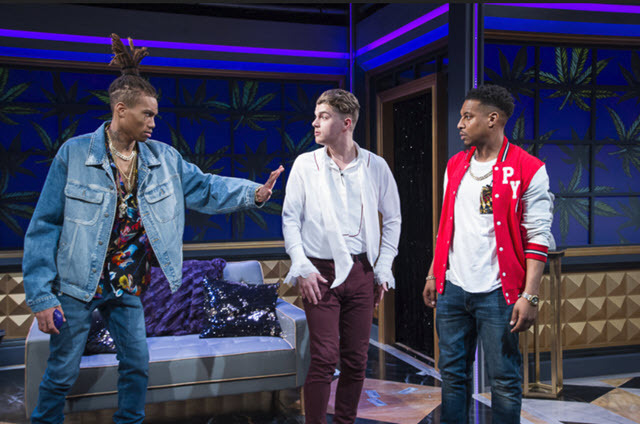 To that end he invites rappers, Alexand Da Great and Blacky Blackerson of P. Y. G. (Petty Young Goons), to his posh pad in hopes he can sign them to his record label, learn their fly moves and adopt their southside of Chicago brand of gangsta rap. There’s a reference to building your narrative while using someone else’s and Blacky is accused of fostering black stereotypes to please Dorian. You have to stay woke, because the humor and the irony come at you with hurricane-like force. Alexand and Blacky are eager to get their hands on “white people’s money” but have their limits as to how much they are willing to take from this rube, especially Blacky who teases Dorian unmercifully when he pontificates on what he thinks it means to be black while taking notes on how they demand he defer to them. It’s hysterical watching the three men analyze what’s blacker, what’s outright appropriation, and why Dorian may not use the “N” word, but they can. Blacky says it so often that Alexand gives him a pocket beeper to substitute a beep for each time he wants to use it. There’s a lot of beeping. 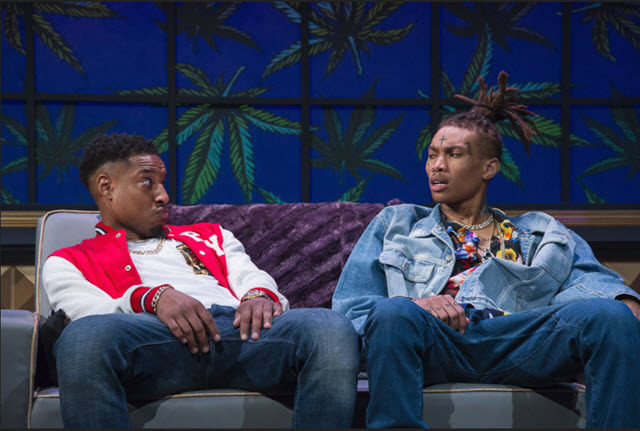 When the men finally buy into Dorian’s experiment, Blacky finds he likes all the things he never experienced in the hood and he becomes bros with Dorian, much to Alexand’s dismay. After all their attempts to “mis-edumacate” Dorian, they start to drift into Dorian’s white world. Question: Will Dorian ever truly relate to black culture and the racial injustices that come along with it, or does he just want to appropriate the style and the music to be cool? “You need to sound like the joy and the suffering of slaves,” Blacky tells him in no uncertain terms. 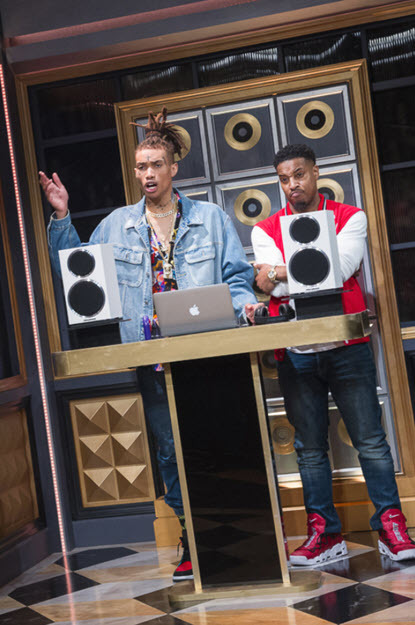 Rap and dance are a big part of this production especially in the explosive scene where the “brothas” demonstrate the hip-hop and breakdancing styles by region from New York to California and Senegal to Zambia. Their dance demos are epic. Impressive direction from Tearrance Arvelle Chisholm who also wrote last year’s Helen Hayes Award-winning play, Hooded, or Being Black for Dummies. Add to that, super fantastic performances by Seth Hill as Blacky Black, Gary L. Perkins as Alexand Da Great, and Simon Kiser as Dorian Belle. Assistant director Mari Andrea Travis, fantastic projections by Kelly Colburn, costumes by Danielle Preston, lighting by Jesse Belsky, sets by Richard Oullette, and sound design by original music by composer Gabriel Clausen, make this world premiere play a must-see. Outrageously funny, insightful and provocative. Highly recommended.